Take charge of your finances with the mySpending Card®. This reloadable, prepaid solution can be used anywhere Visa® debit cards are accepted, which makes it perfect for budgeting. Think of the mySpending Card® as a modern update to your child’s allowance. Only the funds you preload onto the card can be accessed. While your child begins their financial journey, you can track balances and transactions with available Alerts. Adding funds is as easy as making a transfer from your Commerce checking account. Simply balance your “Fun Funds” and your “Bill Funds” with the mySpending Card®. Add the mySpending Card® to your mobile wallet for everyday purchases for a faster way to pay. The mySpending Card® features security protections such as Visa Zero Liability if the card is lost or stolen1 and text Alerts to track transactions. It’s the safer way to stay on the go and on budget. Applying is easy! Purchase online with a Commerce debit card, or get your card instantly at a participating Commerce Bank Branch2. View our application checklist. 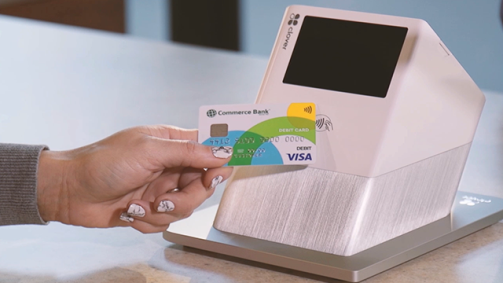 You can now tap to pay at checkout counters that support contactless technology. Follow the instructions below to use your mySpending Card® wherever you see the contactless Symbol3 for fast, more secure4 transactions. Existing customers will receive a contactless Visa® Debit Card after their current card expires. If you do not have a Commerce checking or savings account: Use the Ingo Money app6 to load approved checks using your mobile device. Download the free app on Google Play™ or from the Apple®App StoreSM. We must hear from you no later than 120 days after the transaction was posted to your account. Please refer to the mySpending Card® Cardholder Agreement for more information. Instant issue of a mySpending Card®; is limited to primary cardholders. Secondary cards available for pick up at the branch after 2 p.m. the next day. Online purchases must be issued to customer via U.S. mail. Automated Phone Service Call Fee may apply if loading Card via phone. ACH transactions can include, but are not limited to, direct deposit of payroll, government benefits and tax refunds. Standard text rates/web access charges from your wireless phone provider may apply; see your wireless phone provider for details.